From Soy Sauce has been an avid user of YouTube to promote their games for years. The past two years have seen them use it as a way to communicate with fans and give us a glimpse at the development process. 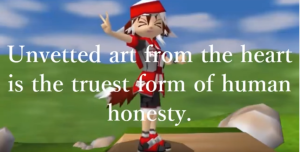 Lately, they have been releasing videos showing off 3D platforming mechanics they are developing in Unity as they prepare for NS Doujin Spirit and future games. However, it is their latest video that is of real interest to us today. 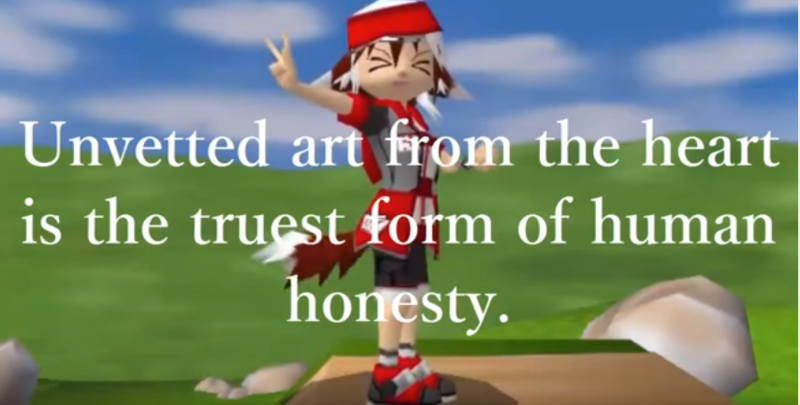 If you can’t read the image, it reads, “Unvetted art from the heart is the truest form of human honesty.” I have embedded the full video below. This video is filled to the brim with inspiration for anyone seeking to make their mark in the world in whatever creative field they aspire to. The whole video is well worth watching and at 2 minutes there is really no excuse. You should also subscribe to the From Soy Sauce YouTube channel and their Twitter @SaijeeHiguchi to get the latest clips of their development process.